Everything you need for a great crochet experience! Struggling to measure gauge? With this handy tool from Addi, the guesswork of working with a ruler is over. Measure your 10x10cm gauge block accurately! Don't let the no-scissor rule deter you from crafting on an airplane. With one of our funky yarn cutters in your notions bag, you'll be set for hours of yarnie fun in the air. 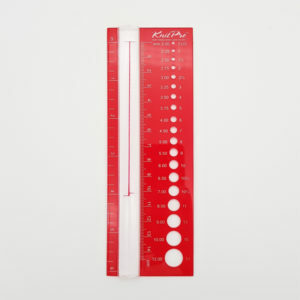 A great tool to check needle size and gauge & can also be used to measure rows and stitches. Full steel body, with a gold head for great visibility with any colour yarn. Precision engineering ensures accurate gauge. KnitPro is widely known to produce crochet hooks of exceptional quality. 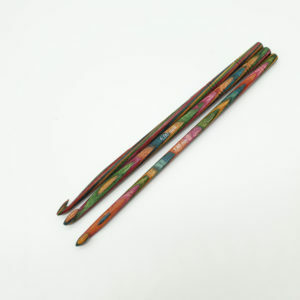 Single ended aluminium crochet hooks with sturdy yet soft grips. Perfectly smooth silver finish with colour-coded grips, unique for each size. In a spectrum of bright and lively colours. Shiny silver tips for ease of crocheting with any colour. Perfectly shaped hooks to crochet easily. Perfectly smooth surface. Very light on the hands. Each measuring tape is 60"/150cm long. Measuring in cm's and inches. Fun design. Keep your shawl and scarves in place with these elegant beauties.